When I first watched the Proenza Schouler livestream of their Fall 2010 show I was skyping with Belle, and when the models all came out for the final walk, we both gave a disappointed, "That's it?" in unison. But in the half a year since, it's become one of my favorites of the season, and I have to wonder if it's the really good ones that you don't get straight away. I loved what Lazaro Hernandez and Jack McCollough did for Spring instantly, and it still tugs at my heartstrings. But Fall didn't have the same pull of neon colors and sequins and feathers that got you straight away. It was all in the details, which didn't translate too well over the show's video. Beaded collars, cropped turtlenecks cleverly layered over netting, sheer thigh highs that just met the hem of a pleated skirt, and a cobalt blue popping up every now and then in the form of a fur cuff or shoe heel all demand more attention than a livestream. I mean, my God, those shoes. 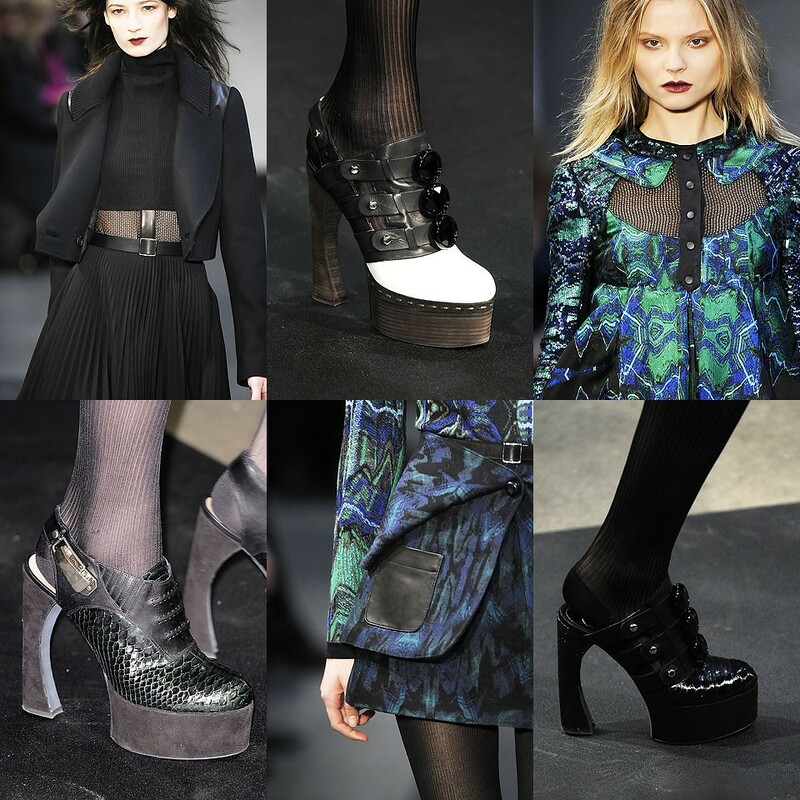 They are so cartoony and wonderful and you can probably keep things like gum and 7" records in the platforms. I didn't think the dresses at the end quite lived up to the rest of the collection. The idea of concluding by taking the angst somewhere a bit sweeter was nice, but the draping felt off, and not in the way the shoes were so clunky they were awesome. The progression did make me excited for the direction Proenza is going in, though. Other than that, it was angsty in all the right places (Tiny pockets! Letterman jacket elements! Babydoll-esque cuts!) and perfectly luxurious in others. For some reason, Jack and Lazaro are really, really good at making me wish I was cool. And while I usually fall for the most extreme of styling and presentation, their attention to detail shows the ways in which ready-to-wear can get somewhere extravagant gowns and headpieces can't. Combining subtlety and angst is seriously where I want to be this fall.